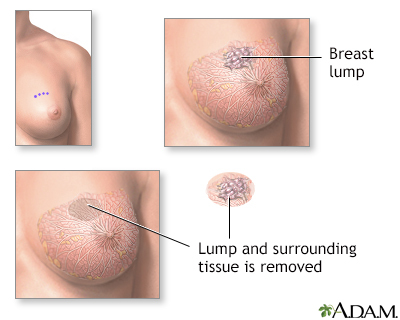 Breast lump removal is surgery to remove a lump that may be breast cancer. Tissue around the lump is also removed. This surgery is called an excisional breast biopsy, or lumpectomy. When a noncancerous tumor such as a fibroadenoma of the breast is removed, this is also called an excisional breast biopsy, or a lumpectomy. Sometimes, the health care provider cannot feel the lump when examining you. However, it can be seen on imaging results. In this case, a wire localization will be done before the surgery. A radiologist will use a mammogram or ultrasound to place a needlewire (or needlewires) in or near the abnormal breast area. This will help the surgeon know where the cancer is so that it can be removed. Breast lump removal is done as an outpatient surgery most of the time. You will be given general anesthesia (you will be asleep, but pain free) or local anesthesia (you are awake, but sedated and pain free). The procedure takes about 1 hour. The surgeon makes a small cut on your breast. The cancer and some of the normal breast tissue around it is removed. A pathologist examines a sample of the removed tissue to make sure all the cancer has been taken out. When no cancer cells are found near the edges of the removed tissue, it is called a clear margin. Your surgeon may also remove some or all of the lymph nodes in your armpit to see if the cancer has spread to them. Sometimes, small metal clips will be placed inside the breast to mark the area of tissue removal. This makes the area easy to see on future mammograms. It also helps guide radiation therapy, when needed. The surgeon will close your skin with stitches or staples. These may dissolve or need to be removed later. Rarely, a drain tube may be placed to remove extra fluid. Your doctor will send the lump to the pathologist for more testing. Surgery to remove a breast cancer is most often the first step in treatment. 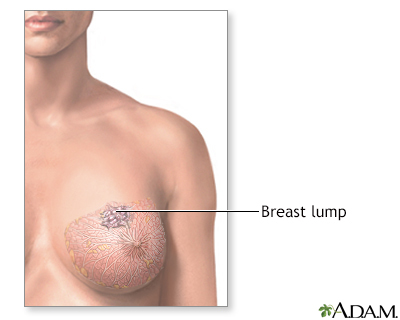 Lumpectomy is often preferred for smaller breast lumps. This is because it is a smaller procedure and it has about the same chance of curing breast cancer as a mastectomy. It is a good option as you get to keep most of your breast tissue that has not been affected by cancer. Mastectomy to remove all breast tissue may be done if the area of cancer is too large or there are multiple tumors which cannot be removed without deforming the breast. The appearance of your breast may change after surgery. You may notice dimpling, a scar, or a difference in shape between your breasts. Also, the area of the breast around the incision may be numb. You may need another procedure to remove more breast tissue if tests show the cancer is too close to the edge of the tissue already removed. You may be asked to stop taking aspirin, ibuprofen (Advil, Motrin), naproxen (Aleve, Naprosyn), clopidogrel (Plavix), warfarin (Coumadin), and any other drugs that make it hard for your blood to clot. Be sure to ask your provider which medicines medications should be stopped, and for how long before your procedure. If you smoke, try to stop for at least 2 weeks prior to the surgery. Your provider can help. Follow your provider's instructions about eating or drinking before surgery. Your provider will tell you when to arrive for the procedure. The recovery period is very short for a simple lumpectomy. Many women have little pain, but if you do feel pain, you can take pain medicine, such as acetaminophen. Your skin should heal in about a month. You will need to take care of the surgical cut area. Change dressings as your provider tells you to. Watch for signs of infection when you get home (such as redness, swelling, or drainage from the incision). Wear a comfortable bra that provides good support, such as a sports bra. You may need to empty a fluid drain a few times a day for 1 to 2 weeks. You may be asked to measure and record the amount of fluid drained. Your provider will remove the drain later. Most women can go back to their usual activities in a week or so. Avoid heavy lifting, jogging, or activities that cause pain in the surgical area for 1 to 2 weeks. The outcome of a lumpectomy for breast cancer depends mostly on the size of the cancer, as well as the make up of the tumor. It also depends on its spread to lymph nodes underneath your arm. A lumpectomy for breast cancer is most often followed by radiation therapy and other treatments such as chemotherapy, hormonal therapy, or both. In most cases, you do not need a breast reconstruction after lumpectomy. American Cancer Society. Breast-conserving surgery (lumpectomy). www.cancer.org/cancer/breast-cancer/treatment/surgery-for-breast-cancer/breast-conserving-surgery-lumpectomy. Updated September 13, 2017. Accessed November 5, 2018. Bevers TB, Brown PH, Maresso KC, Hawk ET. Cancer prevention, screening, and early detection. In: Niederhuber JE, Armitage JO, Doroshow JH, Kastan MB, Tepper JE, eds. Abeloff's Clinical Oncology. 5th ed. Philadelphia, PA: Elsevier Saunders; 2014:chap 23. The American Society of Breast Surgeons. Performance and practice guidelines for breast-conserving surgery/partial mastectomy. www.breastsurgeons.org/docs/statements/Performance-and-Practice-Guidelines-for-Breast-Conserving-Surgery-Partial-Mastectomy.pdf. Updated February 22, 2015. Accessed November 5, 2018.